The 29th Annual Health Information Professionals (HIP) Week runs from March 18 -24, and we are so excited to be a part of it! So many wonderful and talented HIP staff work for ECLAT, and we can’t wait to celebrate our talented team of medical coders and ICD-10 auditors and thank them for the incredible work they do every day. This year’s HIP Week theme, “Our Future is Bright,” accurately represents how we feel about working the critical role of revenue cycle management in the Health Information Management (HIM) industry. As Lou Ann Wiedemann MS, RHIA, CDIP, CHDA, CPEHR, and Fellow of the American Health Information Management Association (FAHIMA) says, “It is a great time to be in the HIM profession, and we believe our future is bright.” ECLAT is so excited to celebrate our HIPs as well as share great insights with other HIM professionals. This year’s HIP week occurs during a very exciting time. AHIMA’s Advocacy Summit and Hill Day also takes place during this week. During these two events, AHIMA members received education about advocacy as they visit the Capitol Hill to inform others on the importance of advancing HIM. In today’s world, information governance (IG) and privacy and security are becoming increasingly crucial topics of discussion. As HIM professionals, we look forward to engaging in crucial industry discussions and sharing important insights with others about these topics. During this week, health information professionals will also participate in focused activities to celebrate HIP week and raise awareness of our organization and expertise. This year, ECLAT will participate in sponsoring food goodies in celebration of this special annual event. The American Health Information Management Association (AHIMA) represents more than 103,000 health information professionals in the United States and around the world. AHIMA is committed to promoting and advocating for high quality research, best practices and effective standards in health information and to actively contribute to the development and advancement of health information professionals worldwide. AHIMA is advancing informatics, data analytics, and information governance to achieve the goal of providing expertise to ensure trusted information for healthcare. We’re looking forward to a fun HIP week here at ECLAT. 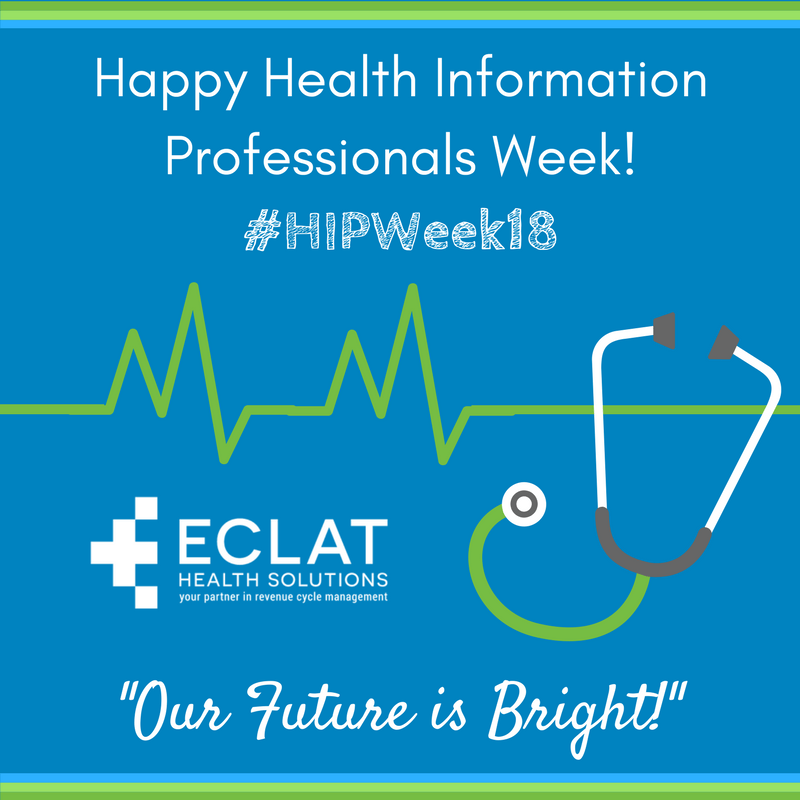 Be sure to follow us on social media and share how you celebrate HIP week with the hashtag #HIPWeek18!